Celebrity Cruises Caribbean sailings offer premium cruising at its best, with cruise rates that your family will appreciate. You will find several available inclusive Celebrity cruises to the Caribbean. Celebrity Caribbean cruises are great fun! If you have sailed with Royal Caribbean International, think of that experience with a notch or two above. Every member of your family will enjoy a Celebrity cruise. There is a wide range of activities onboard and there are many varying sizes of ships, each offering some unique amenities and activities that will appeal to all age groups. You will find a Celebrity ship with an itinerary that is perfect for your family. And while this is premium cruising - a cut above Carnival, Norwegian, or Royal Caribbean - your family will love and appreciate the price you pay for the service you will receive and the memories you will make. From which U.S. port can I board a Celebrity cruise? 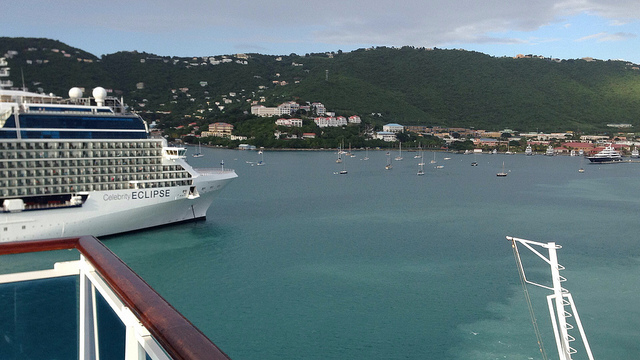 There are three U.S. homeports offering Celebrity cruises to the Caribbean. Two of these are based on the continental United States and one is not. 3. San Juan Cruise Terminal. While there are not many ports providing for inclusive Celebrity cruises, there are many cruise sailings during any given year. What you will appreciate about these three cruise ports is accessibility. Each port is located near a major airport, providing for quick access to and from the cruise port. There are also several transfer options to consider such as that offered by Celebrity Cruises, plus shuttle, or taxi service. Your family will find the right Celebrity Caribbean cruise sailing from one of these popular cruise ports. Celebrity Cruises has several ships of varying sizes that sail to the Caribbean. In terms of ship's age, you can expect to find some newer vessels mixed in with some older ones (ships' debut dates range from 2001 through 2012). All these ships fall into different categories according to size, with Infinity and Summit being among the smallest vessels and the Reflection being the biggest Celebrity ship. All the others are of the same size. Your family will find the right size ship and desired amenities to the Caribbean! Note: The information above is subject to change, as Celebrity Cruises re-positions its ships at will. Where in the Caribbean does Celebrity Cruises visit? You will be happy to know that Celebrity's cruise itineraries have the Caribbean covered. Find inclusive family cruises with Celebrity Cruises to the Eastern, Western and Southern Caribbean. You will find that itineraries include popular ports of call in places such as Aruba, Curacao, Barbados, Antigua, St. Thomas, St. Maarten, Jamaica, Cayman Islands, Mexico, Belize, Honduras and many others. In addition, some longer Celebrity itineraries include calls in places such as Costa Rica and Panama. Your family will find an exciting, inclusive Celebrity cruise heading your way. Note: The itineraries listed above are subject to change. Note too that some itineraries listed have a limited offering. What kinds of foods are served on Celebrity Cruises Caribbean sailings? Well, since you are sailing to the Caribbean, you will find that your cuisines will include West Indian or Caribbean dishes. Additionally, Celebrity Cruises offers varying cuisines onboard Caribbean cruises to appeal to all kinds of appetites. Expect to be taken on a worldwide culinary journey with the hottest trends and high-caliber dining at sea. Consequently, you will find French cuisine, Japanese cuisine, Italian cuisine, among others on board. Note: There are specialty restaurants onboard, offering premium dishes for an additional charge. Although Celebrity Cruises appeals to a more "mature" clientele, whether you are 6, 16, or 60, you will find enough fun on a Celebrity cruise to the Caribbean. There are kids programs, supervised by specially trained workers, for your younger children. Older kids also have activities designed for them and in many cases have their own play areas – dance area, disco, games room, etc. Older kids (60 years old), can always get involved in activities organized by the Cruise Director. Each evening, there is a schedule of events for the next day left in your room. You will find something to do that will keep you entertained. If you choose not to get involved in organized activities, you may visit the fitness center, get a spa treatment, check out some great artwork, splash in a pool, warm yourself in a hot-tub, etc. Additionally, there are several shows onboard – comedy, stage shows, karaoke, and many musicians for your entertainment. I noted before that Celebrity is premium cruising. You can expect more than what you experience on a Carnival or Norwegian cruise. Consequently, you will pay more for a Celebrity Cruises family package. However, when your cruise ends you will agree that it was worth every dollar. And while a Celebrity cruise to the Caribbean generally costs more than Carnival or Norwegian, there are times when you can find a great deal on one of their cruise packages. Check with your travel consultant or send us a cruise quote request. You will be able to give your family an exciting cruise experience to the Caribbean and come away with a great appreciation for the time spent aboard your Celebrity cruise ship. You may use the Search Box below to explore rates on Celebrity cruises to the Caribbean. Celebrity is among those Caribbean cruise lines that add an automatic cruise gratuity charge to your onboard account. However, based on the service received you may ask that your gratuity bill be adjusted up or down. 3. $14.50 per-person, per-day for all other guests. In addition, a service fee is added to purchases made at certain places on board. These include beverages ordered from the bar, specialty restaurants and spa treatments. Note: Check for increases, before sailing. By wide acclaim, Celebrity Cruises is among the top cruise lines to the Caribbean. It is also top-notch in its offering of inclusive family cruises. You and your family will be very satisfied that you chose a Celebrity cruise sailing over another. I guarantee that you will cruise with them again. So, are you ready to book one of many inclusive Celebrity Caribbean cruise sailings? Remember to use the Search Bar above or visit our booking site, PetesTravel.com, to find your cruise ship getaway.